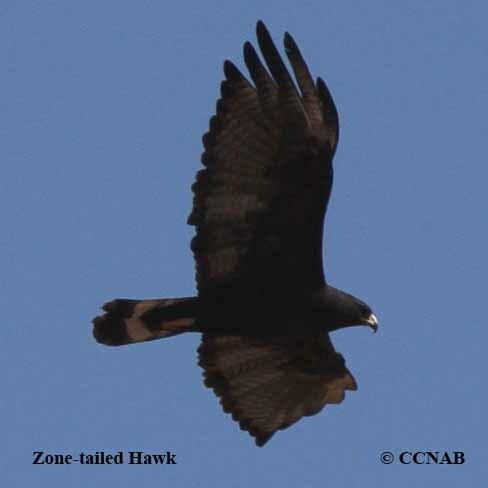 Species: The Zone-tailed Hawk (Buteo albonotatus) is seen along the southern borders of the US and also next to Mexico. 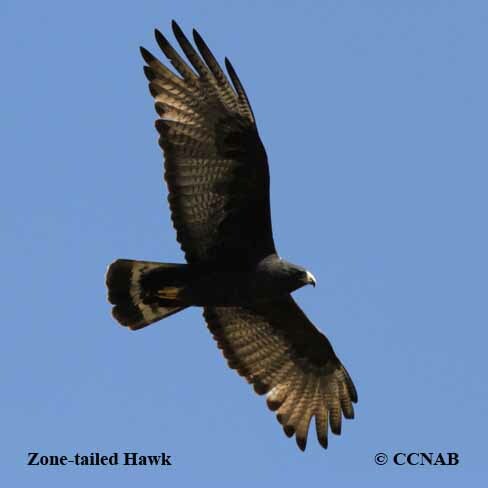 This black hawk is known as an "aggressive mimicry", meaning a predator mimicking a non-predator. 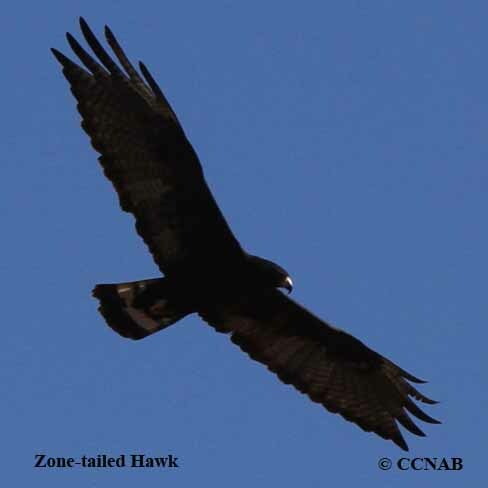 By behaving like this, the buteo flies in a similar manner as the Turkey Vulture (Cathartes aura), wings held in a dihedral manner, slowly flying in a flock of vultures. 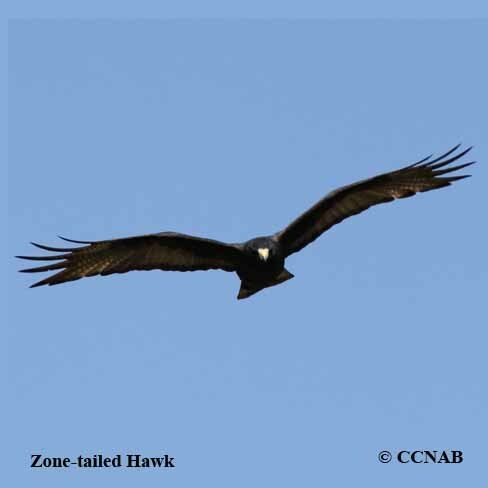 This allows the Zone-tailed Hawk to approach its unwary prey, diving upon it at the first given opportunity. Distinctions: Adults are similar, females larger than the males. Mostly all black plumage, long tail feathers, with one large white band, smaller white bands near body. 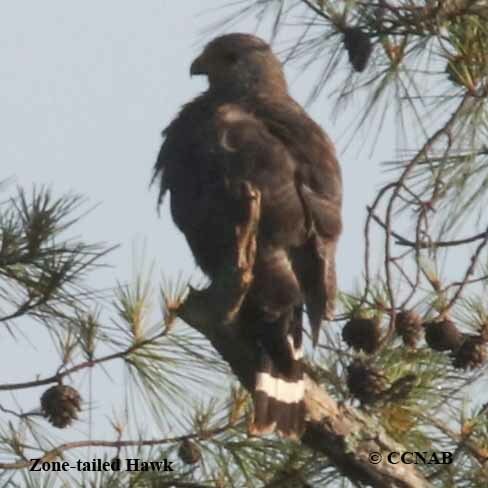 Yellow legs, shorter in nature, than when compared to the Common Black-Hawk. 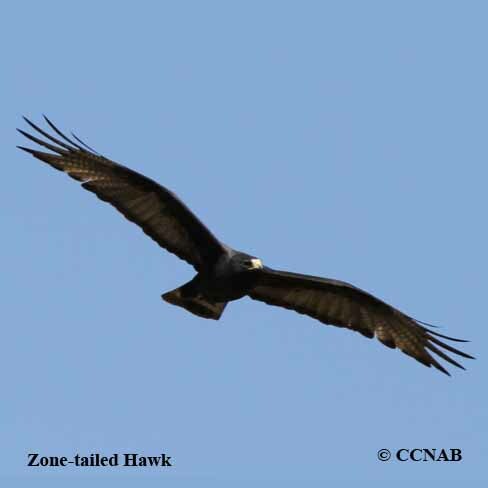 Juvenile similar to parents, except it has multiple thin white bands on the tail feathers. Voice: Similar to other birds of prey, most likely a two syllable note call sounding like kii yiir. Nesting: Two to three white or bluish eggs, dotted with lavender and brown specks. Nest built in the higher limbs of mature trees, likely to be cottonwood, a common tree found close to water sources. Nest composed of branches, sticks, twigs, grasses and other soft materials. Distribution: Found only along the southern borders of the US and Mexico, from California to Texas, reaching into southern Utah and Colorado. There does seem to be a pattern, where their population may be expanding more into the northern parts of the states, where they now exist. Common and more likely to be seen in the southern areas of Mexico and Central America.